Rocking beach parties, traditional Sindhi rituals and reception tables named after personal values were some highlights of Jiten and Romina’s wow wedding fiesta in sunny Spain. 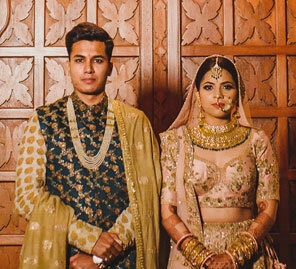 Jiten and Romina pulled off a lavish Indian wedding in the beautiful environs of The Ritz Carlton, Abama, in Spain which overlooks the turquoise waters of the Atlantic Ocean. 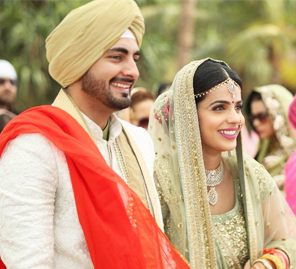 Check out the stunning pictures of the celebrations by WeddingSutra Favorite - DotDusk Studios and other details shared by bride Romina. 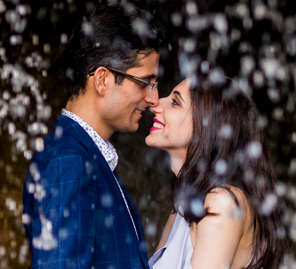 Jiten and Romina first met in 2010 in Madrid, Spain, and felt a special connection between them and became good friends. Their friendship turned into something deeper over time, and before they knew it, they fell in love. After years of dating, the couple finally decided to tie the knot. The bride’s cousin had got married at The Ritz Carlton, Abama, in Tenerife, Spain, a few years ago, so they knew about the venue. One of the requirements of the couple was that vegetarian food is served at their nuptials, and there were not many hotels that offered good vegetarian food in Spain, apart from this one. 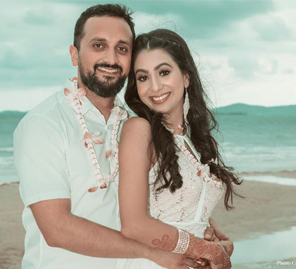 The Ritz Carlton also had different venues available for hosting assorted wedding functions as well as a private beach, so Jiten and Romina decided to get married in this gorgeous property. All the guests were gifted goodie bags when they arrived in their rooms which were designed and picked by family members. The Welcome Lunch was followed by an intimate engagement ceremony called ‘Misri’ which is typically a ring ceremony and the first ritual in a Sindhi wedding. Romina looked beautiful in a powder pink saree, while Jiten looked dapper in a grey and black ensemble. All the guests had arrived in time for the Welcome Dinner, so the couple just wanted to ease them into the festive mood. The vibe for this event was very relaxed and took place on the beach. A rocking party and a heady after-party saw DJ Chuso creating a fun environment with his music tracks and guests danced till early in the morning. These Sindhi wedding ceremonies were conducted for Romina and Jiten in their suites. Everyone who attended the events congratulated both sets of parents. After the ‘Ghari Puja,’ lunch was served for all the guests, and it was followed by the mehndi and sangeet which saw fun dance performances by loved ones. This day started with the Sindhi ‘Vanva Puja’ which is a separate ceremony for the bride and groom and is akin to a cleansing process before the marriage. The mandap with billowing white drapes was constructed by the oceanside and was decorated with bright floral arrangements. It was one of the key scenic highlights of the event. Romina walked down a flower-strewn path into the next chapter of her life surrounded by her loved ones. The ceremony itself was a beautiful blend of wedding customs and was followed by a cocktail and reception which included a sit-down dinner. Every one of the 35 tables had values assigned to it which Jiten and Romina believe in such as trust, commitment, and respect. The bride and groom gave a special performance of a type of dance form called the Flamenco dance. The bride has been doing it for years, and she wanted to do with her husband as a surprise for the guests. Guests were also entertained by the Vyas Brothers who performed at the event.